My garden hates it when I go on vacation. Last year, my tomatoes grew so fast in a mere nine days that they rotted and attracted bugs. Not satiated by the overripe tomatoes, the bugs moved on to the other plants as well. This year, the weather in the beginning of July was hot enough to wilt even the heartiest vegetable. We knew the plants wouldn’t survive on rain alone while we were gone. So we hired our neighbor’s teenage daughter to water the garden daily. Unfortunately, this plan had its own set of unexpected consequences. As it turned out, the end of July was much cooler and rainier than the beginning. Faithfully following our directions, our helper completely over-watered the plants. Although this abundance could have drowned the plants, the rich topsoil created by our lasagna gardening averted that particular disaster. Instead, the main outcome was a huge growth spurt. Normally, this wouldn’t be a problem. Whenever the tomato or eggplants start leaning, I stake or tie them the fence for balance. If they’re exceptionally big, I break off a few branches. It usually just takes a few minutes as I walk in the door from work. But without us there and no instructions to our caretaker, the tomatoes sprawled all over the place. The fence started collapsing from the giant cherry tomatoes and the beefsteak tomatoes fell over and unrooted themselves. The zucchini also unrooted itself, which wasn’t helped by an infestation of squash bugs. Now, this outcome alone would be frustrating, but not take much work to fix. Unfortunately, the vegetables weren’t the only things to grow out-of-control. Last summer, I had almost no weeds. Early this summer, I had a bit of a weed patch down the walkway where the mulch had broken down. Because the weeds were growing slowly, I kept putting off the task. Needless to say, my procrastination caught up with me. 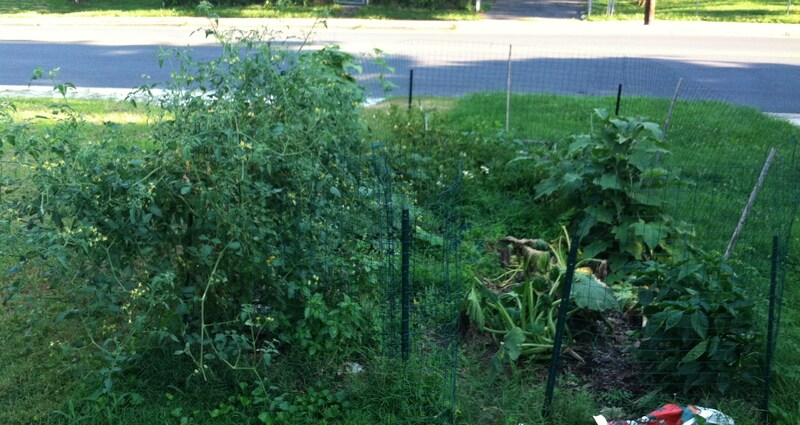 When we came back, weeds had not only invaded the entire walkway, but were overwhelming my tomatoes and beans. As runner-based weeds, once they had a solid foothold, their tentacles spread everywhere. Over the next week, I spent more time pulling weeds than I’d spent in total the year and a half before. As Peru taught me that most rainforest plants are essentially weeds – grow quickly, hyper-competitive, thrive in low-nutrient areas – I was very glad that I didn’t try any farming on vacation. The Before photo. Sorry for the terrible angle. With some TLC, I got almost everything back to normal. The weeds weren’t spreading by seed, so I put them in the composter, allowing them at least to do some good in the long term. Because the zucchinis were rotting, I pulled them out as well. We were able to salvage one gigantic yellow squash. Even though half of it wasn’t any good, it was still enough for many nights of squash-based dishes. The cherry tomatoes are again in need of pruning, but the large tomatoes were irreparably damaged. One still hasn’t produced a single fruit and the other is noticeably more prone to bug infestation. My beautiful purple beans never recovered either. They just couldn’t rebound from the one-two punch of the smothering weeds and a hungry critter. While I hate what happens when I leave, the idea of never going on vacation again for the sake of my garden seems far worse. Perhaps I should mentor my helper so she can actually take over while I’m gone. 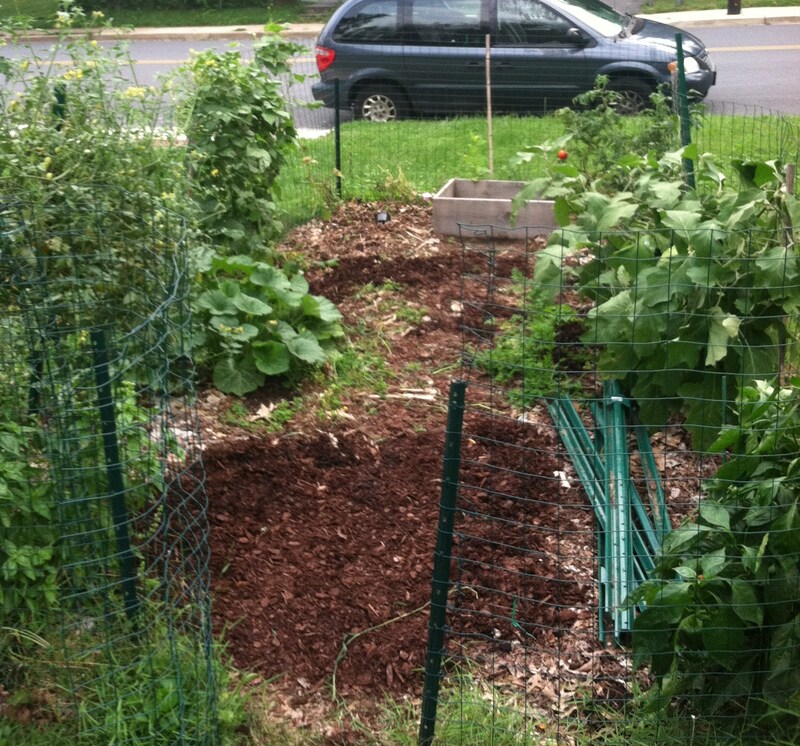 How has your garden done when you’ve gone on vacation? Any advice on how to prepare or maintain it while you’re away? This entry was posted in community, food, gardening, travel and tagged garden maintenance, gardening, travel. Bookmark the permalink. So true. I’m lusting after chickens and bees and am wondering about the same issues: how to put down roots but still be free to roam?! I think you’re right on that a well-trained helper is the answer. The last two years I’ve planted my garden in May and early June, then left it to fend for itself for the end of June to mid-July. I always mean to make an automatic watering system, but this year getting Lyme at the beginning of June meant that that didn’t happen (nor did the whole garden get planted). I was amazed, both years, to discover that the garden–though terribly weedy, and a bit bug-eated–had done just fine on it’s own. I don’t grow tomatoes or zucchini, though. Tomatoes are dangerous to your other plants if you let them grow out of control – they’ll completely shade out or suffocate them if they’re too close. We recently bought a rain barrel, so I’m hoping that I can set up a bit of a watering system from that in the future. Also, I’m sorry that you got Lyme this year! I’ve heard it’s horrible and with so many deer in our area, I’m always nervous I’ll have ticks on me. Yes, I do know English!